The index opened strong around 7777 and scaled 7800 within the first few minutes and stayed strong to close near the highs of the day at 7850.45, huge gain of 141.50 points. The broader market was strong with 1029 advances to 524 declines. The range for series is at 7400-8000. Call option 8100-8300 added 17.31 lacs OI with short covering seen at 7800 and below strike prices. Put option 8000-7700 added huge 51.24 lacs OI with profit booking seen at 7600 and below strike prices. 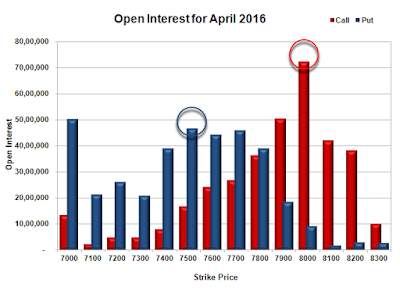 Nifty Open Interest is at 1,62,15,450 up by 13,45,950, with increase in price, most probably huge long build-up. Bank Nifty Open Interest is at 17,21,580 up by 77,070, with increase in price, most probably huge long build-up. FII’s bought huge 29263 contracts of Index Futures, which includes net 32538 contracts long build-up and 3275 contracts short build-up, with increase in net OI by 35813 contracts, includes 71400 longs to 42137 shorts for the day. FII’s Index future open contract as on date is 151735 Longs to 93444 Shorts, Net 58291 up by 29263 contracts. Initial support at 7800, with huge OI addition of 25.61 lacs and below that at 7700 with OI of 45.92 lacs. 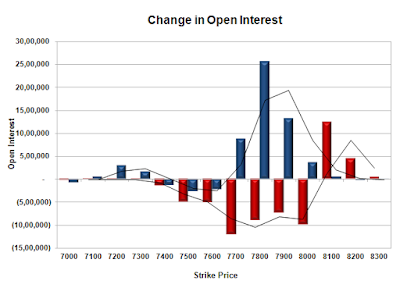 Initial resistance at 7900, with OI of 50.44 lacs and above that at 8000 with OI of 72.34 lacs. 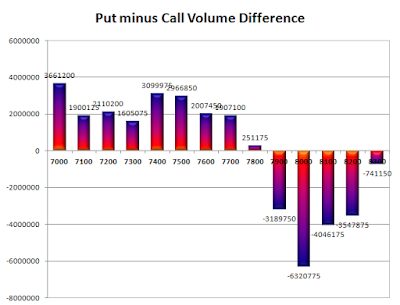 Day Range as per Option Table is 7760 - 7907 and as per VIX is 7785 - 7916 with 7829 as the Pivot.